If you are not in the cloud yet, you need to get moving.That’s just one of the conclusions from a recent study that finds cloud computing is growing even faster than believed, and that those who have made the switch are enjoying the promised cost benefits, without the security concerns often cited by the technology’s detractors. The study surveyed more than 500 organizations, including larger and smaller companies in the United States and Europe. An amazing 87% of respondents report the adoption of cloud services in the past three years. 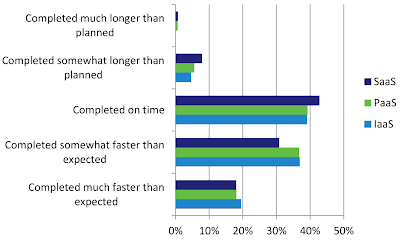 More than half said that cloud deployment was completed ahead of schedule, and 40% raved that the cloud has exceeded their expectations – see chart below. 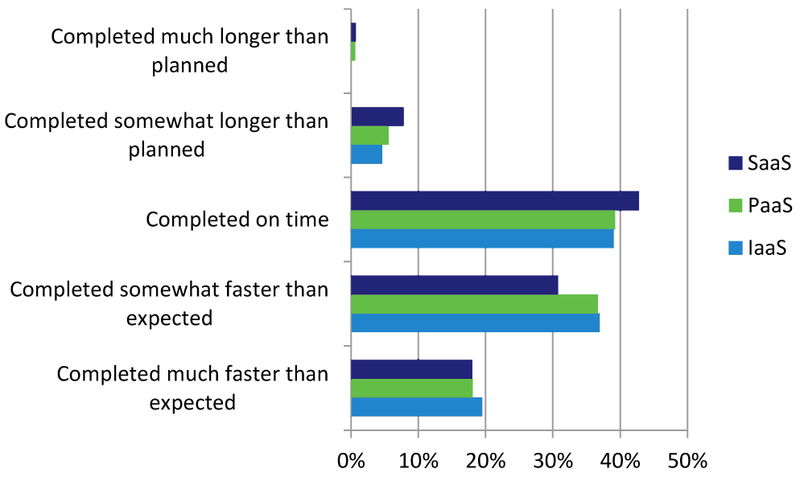 This positive result was surprising for many companies, since many have experienced in the past that IT projects almost always took longer than planned. What about security? According to this survey, 98% said that the cloud met or exceeded their expectations in this area. That may be a surprise to those who remain hesitant about the technology for this reason. In fact, there were indications that those in the cloud industry need to do a better job of addressing these worries, and in closing the gap between perceived and actual security risk. A Ponemon study, quoted in the survey article, reveals that some of these risks are a result of companies not adhering to recommended security practices. Bottom line? If you have not considered cloud services yet, now would be a good time to do so. At this point the business and technology benefits are simply too substantial to ignore. The full study is available here and you can also follow this link to learn more about cloud-based call center software.